So we’ve finally hit the point we’ve been trending to for a decade or so: the summer movie season of 2019 is basically an uninterrupted line that started with Captain Marvel in early March, and now doesn’t end until mid-August. Having a big popcorn movie in March isn’t a new thing, of course; nor is having a big popcorn movie in April. The thing is that this April we have two, a pair of big honking comic book movies (one of them much bigger and more honking than the other), so that the twofer of Captain Marvel and Us leads right into a non-stop feed of big movies that won’t slow down basically even for one weekend for the forseeable future. I mean, not every single weekend has a huge new release, but the gaps between the huge releases are starting to get mighty thin. Time will tell if this is a new normal, or if 2019 is just weirdly bulked up (I think it’s the latter), but I confess to feeling a smidgen exhausted just looking at this calendar. So with that said, here’s Shazam! 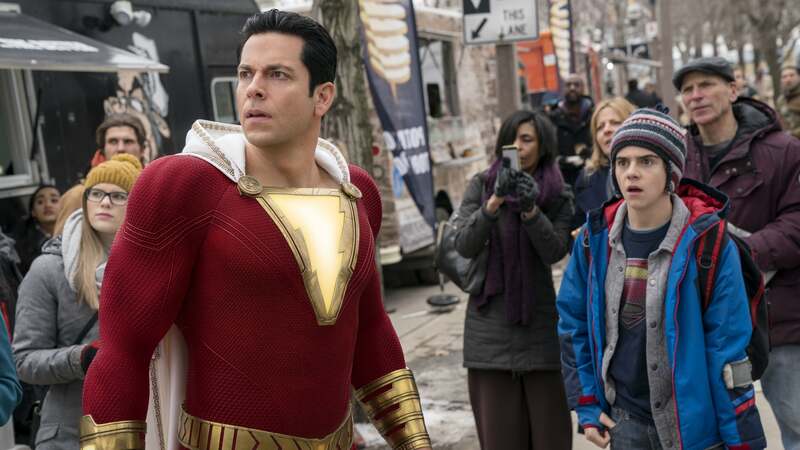 – a film that I swear was originally announced as a stand-alone adventure for the other hero sometimes known as Captain Marvel, though by this point, it has been probably inevitably swept up into the rather vaguely-shaped DC movie universe. It’s getting pretty strong reviews, stronger than I would have expected at least, but I’m having an extremely hard convincing myself to believe in them. It looks awfully chintzy, from the trailers. And maybe this is part of the alleged fun, but Captain Marvel left me feeling so hostile to the whole “remember the ’90s?” ethos that seeing a movie which appears to have been made with a ’90s level of technology is not triggering my pleasure receptors on any level. Trundling along for table scraps, we have a new adaptation of Stephen King’s Pet Sematary that seems to be just as dull and pointless as the trailers promised, overt Wicker Man lifts or no. We also have The Best of Enemies, which stars Taraji P. Henson as a civil rights activist and Sam Rockwell as a Southern racist (hell of a thing to specialise in, but that’s where he seems to be content to idle right now), and if it were even marginally good – if it weren’t transparently awful – it would surely have gotten something resembling an awards-friendly release. But even so, I’m guessing it will be the best feature Henson has been associate with in a rather long time. Salvaging the weekend, if not indeed the whole month, are two limited releases from two of the most important directors in the world: Claire Denis’s sci-fi thriller High Life, and Mike Leigh’s historical labor drama Peterloo. Even if the latter is a bit of a miss, the former is among my most-anticipated films of the year, and I won’t hear a word otherwise. Laika, the little underachieving studio whose stop-motion animated films have been some of the best bits of loving hand-crafted cinema of the decade, hasn’t failed me yet. But the ad campaign for Missing Link, a comedy with Zach Galifianakis as Bigfoot and Hugh Jackman and Zoe Saldana as Victorian-era adventurers, is trying my faith awfully hard. It looks very broad. And simple. And plotty. Still, not a lot of work to look like the best release of this particular weekend. After, a romantic drama, barely seems to actually exist, and Little, a kind of gender-swapped reverse Big, looks interesting chiefly for how angry I intend to be about its meager amount of Regina Hall. Leaving only Hellboy, second film of that name, only this time with a gone-to-seed Neil Marshall directing instead of a height-of-his-powers Guillermo del Toro. If anything this weekend surprises me, I’m sure this will be it, but it looks like such drudgery. April means a new Disney documentary, and this time it’s about Penguins. Specifically about how penguins have human names and long to form nuclear families. Extremely hard pass. Elsewhere, we come to the year’s second high-profile movie targeting religious conservatives, Breakthrough, and the trailer showcases enough overripe compositions and clattering “prayerful” dialogue that it reminds me of all the reason I love to hate this genre. Fingers crossed it’s as campy as it looks. Look, these Atomic Monster horror films all have exactly the same monster design and exactly the same narrative beats and exactly the same mechanistic jump scares, but they are cozy and comfortable to me. And that is why, God help me, I am actually excited for The Curse of La Llorona, which takes a beloved Mexican ghost story and gives it the big Hollywood treatment. In limited release, Under the Silver Lake has yet another planned date, and who knows, maybe this one will actually stick. And here it is: Avengers: Endgame, the movie to end all movies (sadly, not literally), a movie that we all know everything about already, and nothing at all. Even if I didn’t slightly despise the Marvel Cinematic Universe and Disney at this point, giving a 182-minute running time to a superhero movie would unquestionably be enough to do the job. But what does it matter, this is more like a force of nature than a movie. Sony Pictures Classics has decided that they’re going to go right on ahead and offer Ralph Fiennes’s biopic of Rudolf Nureyev, The White Crow, as counterprogramming, and God bless their hearts for that.